FILE - In this July 24, 2016 file photo, a U.S. military personal stands guard during a graduation ceremony for Afghan troops, in Lashkargah, capital of southern Helmand province, Afghanistan. Afghanistan is expected to get up to 200 helicopters and other aircraft as part of a four-year plan to improve the nation's security forces to help beat the Taliban insurgency, according to Dawlat Waziri, the spokesman for the Afghan Defense Ministry. Waziri said discussion of the plan is part of the agenda of a top level U.S. delegation expected to visit Kabul over the next couple of weeks. U.S. officials have not publicly confirmed the reported trip, but their Afghan counterparts have been discussing the expected agenda. Ahead of the visit, Afghanistan’s National Security Adviser Haneef Atmar held a one-hour video conference Wednesday with his American counterpart H. R. McMaster to discuss bilateral security cooperation between the two nations. 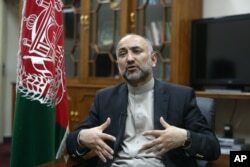 FILE - In this Oct. 24, 2015, photo, Afghan National Security Adviser Mohammad Hanif Atmar speaks during an interview with The Associated Press, in Kabul, Afghanistan. The trip by the first high ranking U.S. delegation to visit Kabul since the change of administration in Washington is also expected to discuss continuing U.S. assistance to the country, according to the speaker of Afghan parliament Abdul Raouf Ibrahimi. A source says Russia, Iran and Pakistan will be discussed. Another high level Afghan source said the delegation would also discuss the involvement of Russia, Iran, and Pakistan in Afghanistan. While U.S. officials have long accused Pakistan of providing sanctuaries to the Taliban, they have recently become wary of the growing influence of Russia and Iran in Afghanistan. 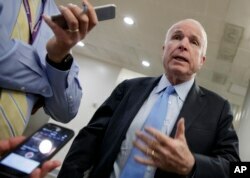 FILE - Senate Armed Services Committee Chairman Sen. John McCain, R-Ariz., speaks to reporters on Capitol Hill in Washington, Wednesday, March 8, 2017. Russia is hosting a regional conference on Afghanistan in April in which the U.S. was invited but has declined to attend. Afghanistan is still debating whether to attend according to the Ministry of Foreign Affairs. 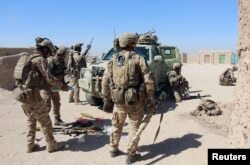 Afghanistan’s four-year security plan would also double the Afghan Special Forces, upgrading what is now a division of Special Forces to a corps, according to Defense Minister General Abdullah Habibi in his briefing to the Afghan parliament. FILE - Afghan Special Forces prepare themselves for battle with the Taliban on the outskirts of Lashkar Gah capital of Helmand, Afghanistan, Oct. 10, 2016. The Special Forces have been one of the most successful units of the Afghan security apparatus in its fight against the Taliban. The defense minister added the forces would be used to drop into Taliban controlled areas, denying them the opportunity to plant landmines as they flee. The plan is also supposed to focus on the training and literacy of Afghan security forces and strengthening intelligence services. According to the Defense Ministry spokesman, the beefing up of the air force, including not just the aircraft but also radar systems and other parts, would be completed by 2020. NATO and EU delegations are also expected to visit Kabul in the next few weeks.